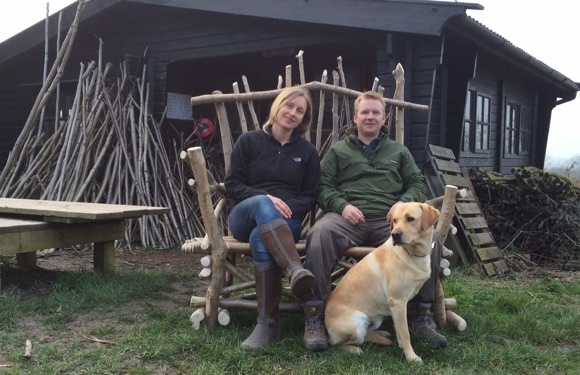 Location: Coppice Designs Rustic Workshop at Goldstones Farm. See the Courses page for full address and local map. 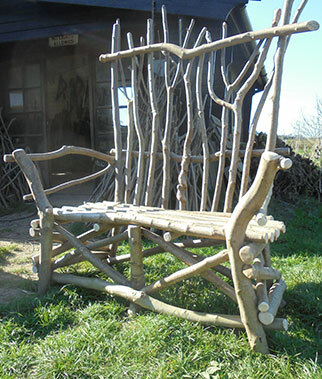 Look out for our Coppice Designs arrows on the roadside. Please take care when entering this working farm. 9am for a 9.30 start after a cuppa, day finishes at 5pm or earlier if you have other commitments. Tea and coffee are available at breaks, both morning and afternoon with biscuits provided to keep up energy levels. Please bring a packed lunch with you unless otherwise stated. Please wear workwear and sensible shoes. Group Bookings: Places available for up to four people. Single group bookings of two to four people can be made on other dates to suit you (and us), not weekends though and preferably a Tuesday, Wednesday or Thursday. One to One or One to Two: If you are not confident of your strength or abilities or perhaps you would prefer a higher level of tuition, I can offer 'one-to-one' days for £300 per day. 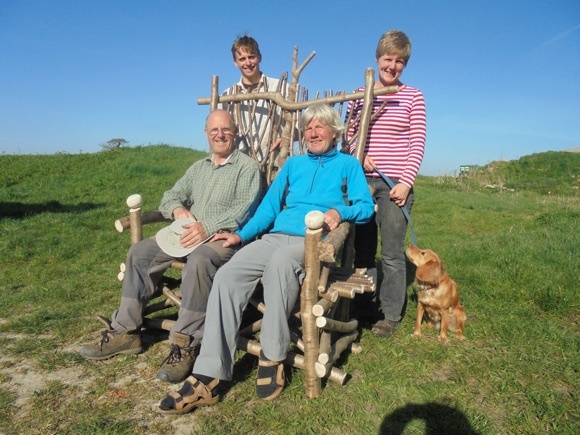 "Rachel and I had a lovely time and thoroughly enjoyed making our chairs." Laura Joy, herts. "Cracking day yesterday Andy, thanks very much - much impressed with the final result ----- likes it so much, she wants it in the house." Phil Davis, Finchley. "We had an amazing day and achieved so much - very proud - and thoroughly enjoyed it - great teacher" Tracy Young, Ely. 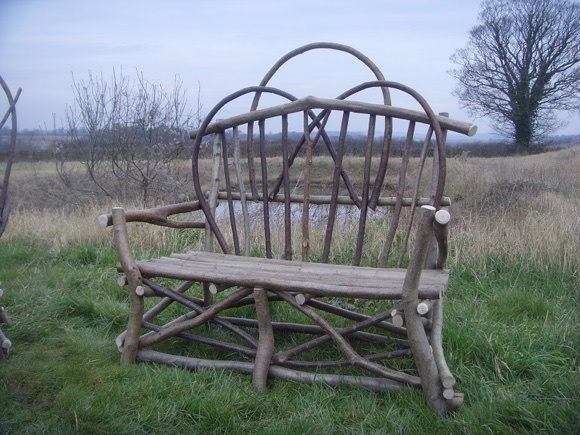 "two people can make a bench between them, a great project, price just £300.00 for the day – no counselling given however!" "Thanks again for such a great workshop - appreciated your supportive approach." Helen Palmer. 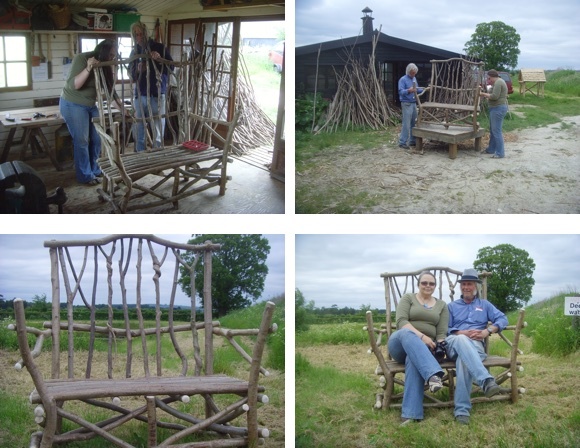 Going Loopy, this fantastic three seater was made over two days and included a session bending the bows after steaming them. 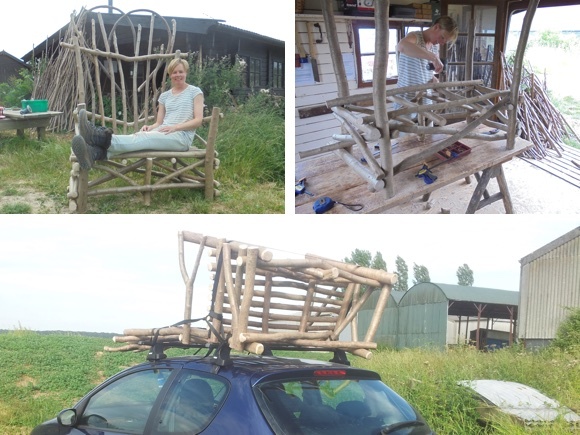 Emma Middleditch wanted a bench and arbour along with a fabulous day out with her mates, this humungous creation is the result, in just one day. How gorgeous will it look with a vine or rambling roses growing up and over it. With all the hazel that went in to this a small 'extra material' supplement was payable on top. 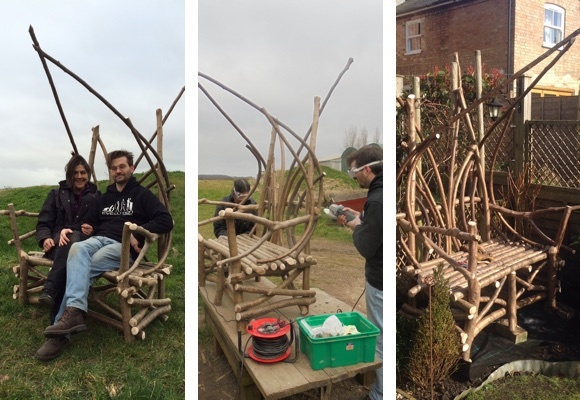 "Thank you for such a marvellous day - can't believe how wonderful the bench has turned out." Kim and Garett Goode. We provide a print out detailing full after care instructions. Helpers can come along and help, age range from 8-80 years, no charge - just let me know in advance. To arrange a day between April and November, email me direct with two or three dates, preferably Tuesday/Wednesday/Thursday. Some Saturdays are available - but not many, due to attending shows etc. They are also a little dearer at Â£350.00. For groups of up to three or four people we can make special arrangements. (Normal courses run with just two people.) And we offer good discounts for a block booking - please contact me. For a "never to be forgotten" gift and an absolutely unique present, Vouchers/Gift Tokens are available. The dates can be confirmed by the recipient.